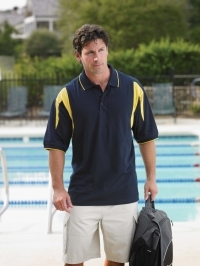 Jersey Performance Polo, ProLine performance 52% Cotton/48% Polyester featuring moisture wicking. Unique fabric with jersey on the outside and mesh inside allows you to stay cool. Vented sleeve contrast inserts and dyed to match buttons, tipped collar and welt cuffs, double needle hemmed bottom with side vents.